Surprisingly I've never shot an outfit post featuring this top (I must have more clothes than I thought). Today breaks that… kind of. This isn't an official 'Outfit post' but I wanted to showcase this top which was my mother's in the 1990s. 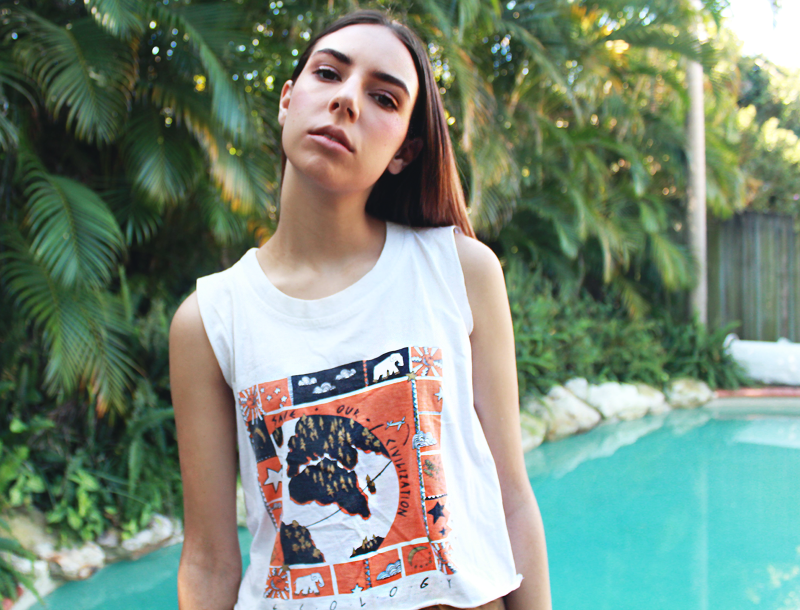 It was an oversized t-shirt that I altered into a sleeveless crop a couple of years ago. With 20 odd years in its stitches, it's on the verge of needing some TLC (or most likely the bin). But when and if that happens, I'll be sure to cut the graphic from the front and re-incorporate it into another piece. Way too cool to throw away! You may have also noticed that I dyed my blonde ombre ends brunette again. It's only a rinse but I wanted to see what it would look like before I went ahead and permanently dyed it fully back to my natural colour. I love it and it definitely needed some major nourishment from those fried blonde ends. What are your thoughts?